Blues for Everyone teaches music lovers of all ages the joy of Blues music, fulfilling one of the stated missions of the Minnesota Blues Society to: "educate and promote the past, present and future of Blues music in Minnesota." Blues for Everyone workshops are scheduled through schools, community organizations, festivals and events. Workshops are custom designed to meet the needs of the audience and can include guitar, harmonica, piano, vocals, or Blues history. 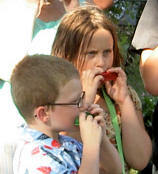 Our most popular workshop provides kids with a free harmonica and lesson. Saturday, June 03, 2017, 11:00 AM. Rice Lake Public Library, 2 E Marshall St, Rice Lake, WI 54868, 715-234-4861. Music of the Mississippi Harmonica Lesson w/ Performance by Everett Smithson Band. Free Harmonicas provided by Minnesota Blues Society. All ages welcome. Monday, June 05, 2017, 4:00 PM. Blue Earth Community Library, 124 W 7th St, Blue Earth, MN 56013, 507-526-5012. Music of the Mississippi Harmonica Lesson w/ Performance by Everett Smithson Band. Free Harmonicas provided by Minnesota Blues Society. All ages welcome. Monday, June 05, 2017, 11:00 AM. Waseca Le Seur Library, 408 N State St, Waseca, MN 56093, 507-835-2910. Music of the Mississippi Harmonica Lesson w/ Performance by Everett Smithson Band. Free Harmonicas provided by Minnesota Blues Society. All ages welcome. Tuesday, June 06, 2017, 2:00 PM. New Ulm Public Library, 17 N Broadway, New Ulm, MN 56073, 507-359-8331. Music of the Mississippi Harmonica Lesson w/ Performance by Everett Smithson Band. Free Harmonicas provided by Minnesota Blues Society. All ages welcome. Tuesday, June 06, 2017, 10:00 AM. Wells Public Library, 54 1st St SW, Wells, MN 56097, 507-553-3702. Music of the Mississippi Harmonica Lesson w/ Performance by Everett Smithson Band. Free Harmonicas provided by Minnesota Blues Society. All ages welcome. Monday, June 12, 2017, 10:00 AM. Comfrey Public Library, 120 Brown St W, Comfrey, MN 56019, 507-877-6600. Music of the Mississippi Harmonica Lesson w/ Performance by Everett Smithson Band. Free Harmonicas provided by Minnesota Blues Society. All ages welcome. Monday, June 12, 2017, 8:00 PM. Winthrop City Library, 303 Main St N, Winthrop, MN 55396, 507-647-5308. Music of the Mississippi Harmonica Lesson w/ Performance by Everett Smithson Band. Free Harmonicas provided by Minnesota Blues Society. All ages welcome. Tuesday, June 13, 2017, 3:00 PM. Hanska Community Library, 201 Broadway St, Hanska, MN 56041, 507-439-6248. Music of the Mississippi Harmonica Lesson w/ Performance by Everett Smithson Band. Free Harmonicas provided by Minnesota Blues Society. All ages welcome. Tuesday, June 13, 2017, 10:30 AM. Springfield Public Library, 120 Cass Ave, Springfield, MN 56087, 507-723-3510. Music of the Mississippi Harmonica Lesson w/ Performance by Everett Smithson Band. Free Harmonicas provided by Minnesota Blues Society. All ages welcome. Wednesday, June 14, 2017, 1:30 PM. Martin County Library Fairmont, 110 North Park, Fairmont, MN 56031, 507-238-4207. Music of the Mississippi Harmonica Lesson w/ Performance by Everett Smithson Band. Free Harmonicas provided by Minnesota Blues Society. All ages welcome. Wednesday, June 14, 2017, 10:00 AM. Muir Library Winnebago, 36 Main St N, Winnebago, MN 56098, 507-893-3196. Music of the Mississippi Harmonica Lesson w/ Performance by Everett Smithson Band. Free Harmonicas provided by Minnesota Blues Society. All ages welcome. Wednesday, June 21, 2017, 6:30 PM. Blaine Town Square Park, 10802 Town Square Dr NE, Blaine, MN 55449, 0. Music of the Mississippi Harmonica Lesson w/ Performance by Everett Smithson Band. Free Harmonicas provided by Minnesota Blues Society. All ages welcome. Thursday, June 22, 2017, 6:30 PM. Huber Park Shakopee, 407 1st Ave E, Shakopee, MN 55379, 952-233-9300. Music of the Mississippi Harmonica Lesson w/ Performance by Everett Smithson Band. Free Harmonicas provided by Minnesota Blues Society. All ages welcome. Monday, June 26, 2017, 1:00 PM. La Crescent Public Library, 321 Main St, La Crescent, MN 55947, 507-895-4047. Music of the Mississippi Harmonica Lesson w/ Performance by Everett Smithson Band. Free Harmonicas provided by Minnesota Blues Society. All ages welcome. Tuesday, July 04, 2017, 6:30 PM. The Lake, W Edgehill St, Luverne, MN 56156, 507-283-4061. Music of the Mississippi Harmonica Lesson w/ Performance by Everett Smithson Band. Free Harmonicas provided by Minnesota Blues Society. All ages welcome. Saturday, July 08, 2017, 11:40 AM. Watona Park, 0, Madelia, MN 56062, 507-642-3314. Music of the Mississippi Harmonica Lesson w/ Performance by Everett Smithson Band. Free Harmonicas provided by Minnesota Blues Society. All ages welcome. Tuesday, July 11, 2017, 6:30 PM. Mille Lacs County Historical Society Depot, 101 10th Ave S, Princeton, MN 55371, 763-389-1296. Music of the Mississippi Harmonica Lesson w/ Performance by Everett Smithson Band. Free Harmonicas provided by Minnesota Blues Society. All ages welcome. Blues For Kids Is Fun! Enquire About A Program For Your Next Event. I cannot tell you what an impression you made on so many students today! Joe worked VERY hard and our students were so fortunate to get to meet you, hear you play and to learn from you. As a music teacher I really appreciated your ability to teach the blues chord progressions and the sounds of these genres of music so easily to our young students. Our students were highly engaged with everything you told them about the blues and their eyes were wide as saucers when you handed them a harmonica! I have heard so many good comments from the students already. One little girl next to me said, 'this is SO cool.' Smiling. High praise from a 6th grader indeed. I sincerely thank the blues society of Minnesota for making this contribution and supporting you in this new endeavor. All students in the state of Minnesota should be so fortunate as to have your teaching and playing abilities available to them! Our sincerest thank you to both the Blues Society and Joe!" For more on this, please see the article in The Woodbury Bulletin. I would like to personally express my appreciation for your support of my students learning about the blues and how to play the harmonica. The session given by Joe Filipovich at our school was outstanding and the students were so excited to hear him play and to make music with him. The way Joe taught the students was clear and concise for all students to be able to understand and access the blues. The best part of all it was of course hearing these students come out of the clinic saying how "cool" it was to play their harmonicas and to get to play the blues. Your generous contribution brought some 300 students together to hear the blues played by Joe and about 50 students benefited directly in getting a new harmonica and being inspired to learn more. I sincerely hope you will collaborate with more people like Joe to spread this music to our schools and inspire more young children with events like these in the future. Music/Instrumental Instructor at Valley Crossing School"
On behalf of our school and student body at Seven Hills Preparatory Academy, I'd like to share our great enthusiasm for having Joey Filipovich share with our students. Through the class presentations and harmonica workshops, as well as the afternoon performance for our entire school, our students were inspired through blues music. Our students still express their excitement to have their own harmonica which they've been exploring since Joey's visit. 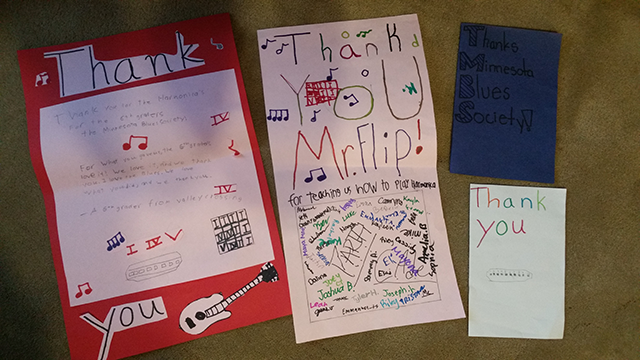 Again, thank you for coming to our school and sharing your talents with us, and thanks to the Minnesota Blues Society organization who so graciously offered the harmonicas to our young students. We appreciate your time and effort to promote the art of music and blues in particular. — Hi & Lois ©King Features by permission of Greg Walker. Thursday, February 11, Valley Crossing Grade School - Woodbury, MN. Joe Filipovich, instructor. Thursdays, February 11, 18, 25 March 3, 17. Blues Studio For School, East Ridge High School - Woodbury, MN. Joe Filipovich, instructor along with Annie Mack and Mike Fugazzi. Friday, March 11, TBA. Joe Filipovich "might be volunteering with the Patrick's Cabaret by hosting a youth showcase to have some youth musicians perform." Saturday, May 14, TBA. blues for kids workshop at Granite Falls, MN music festival. Joe Filipovich, instructor. Saturday, May 14, 10 am. Thomas St Angelo Public Library, Cumberland, WI. Free Blues for Kids Harmonica class by Everett Smithson. Kids! Sign up at event. Saturday, July 9, 10:30 am. Madelia Bluesfest - Madelia, MN. Music at 11 am. Free Blues for Kids Harmonica class by Everett Smithson. Kids! Sign up at event. Saturday and Sunday, July 9 & 10, TBA. Brookings Summer Art Fair - Brookings, SD. Free Blues for Kids Harmonica class by Everett Smithson. Kids! Sign up at event. Tuesday, July 12, 6:30 pm at Mille Lacs County Historical Society - Princeton, MN. Free Blues for Kids Harmonica class by Everett Smithson. Music at 7 pm. Kids! Sign up at event. Thursday, July 14, 2:30 pm @ Hennepin County North Regional Library, 1315 Lowry Avenue North, Minneapolis, MN. Harmonica and instruction. Rhona Brack, instructor. Open to the public. Ages 8-16, limit 20. Sign up at the event. Wednesday, July 20, Northfield Memorial Pool, Northfield, MN. Music at 6 pm. 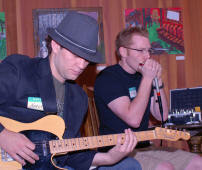 Free Blues for Kids Harmonica class by Everett Smithson at 7 pm. Kids! Sign up at event. Thursday, July 28, TBA. Scott County Fair - Jordan, MN. Free Blues for Kids Harmonica class by Everett Smithson. Kids! Sign up at event. Saturday, August 6, TBA. Freeborn County Fair - Albert Lea, MN. Free Blues for Kids Harmonica class by Everett Smithson. Kids! Sign up at event. Saturday, September 24, 1 pm. Chilifest, Racetrack County Fairgrounds - Princeton, MN. Free Blues for Kids Harmonica class by Everett Smithson. Kids! Sign up at event. Music at noon. Sunday, October 2, 1 pm. Deer Lake Orchard - Buffalo, MN. Free Blues for Kids Harmonica class by Everett Smithson. Kids! Sign up at event. Music at noon. Thursday, February 19, 6:30 pm; Great River Regional Library, 18 NW Lake Blvd., Buffalo, MN 55313, 763-682-2753. Free Blues for Kids Harmonica class by Everett Smithson. Kids! Sign up at event. Friday, March 6, 1 pm; University of Wisconsin - Marathon County Auditorium, 518 S 7th Ave, Wausau, WI 54401, 715-261-6100. Blues in the schools event hosted by Everett Smithson. Saturday, May 30, (Two Classes) 1:30 pm and 2:30 pm; Smokin' In Steele, Steele County Fairgrounds, Owatonna, MN. Mike Fugazzi, instuctor. First 20 kids ages 8 to 18 years-old registered for each class. Registration Form. Tuesday June 9, 2015, 6:30 pm at Mille Lacs County Historical Society - Princeton, MN. Free Blues for Kids Harmonica class by Everett Smithson. Kids! Sign up at event. Saturday, September 19, Lessons at 12 pm at Merriam Terrace Park - St Paul, MN. Harmonica instruction by Joe Filipovich and Rhona Brack. Blues Studio For School Fundraiser, Sunday, November 15, 1 pm @ Minnesota Music Cafe. Music by Sweet Tea, Armadillo Jump, Squishy Mud and The Blue Cities. Bake Sale and Music Swag. Saturday, February 1, 2014, 11 am - noon @ Dakota County Galaxie Library, 14955 Galaxie Avenue, Apple Valley, MN. Harmonica and instruction. Rhona Brack, instructor. Open to the public. Ages 8-16, limit 20. Registration required, call 952-891-7045 to register. Saturday, February 1, 2014, 2:30 - 3:30 pm @ Dakota County Wescott Library, 1340 Wescott Road, Eagan, MN. Harmonica and instruction. Steve Vonderharr, instructor. Open to the public. Ages 8-16, limit 20. Registration required. Call 651-450-2900 to register. Saturday, Feb. 8, 3 – 4 pm @ Hennepin County North Regional Library, 1315 Lowry Avenue North, Minneapolis, MN. Harmonica and instruction. Rhona Brack, instructor. Open to the public. Grades 3-9. Registration begins Jan 11. Call 612-543-8450 or register online. Sponsored by Friends of the North Regional Library. Saturday, February 15, 2014, 10:30 - 11:30 am @ Dakota County Robert Trail Library, 14395 S Robert Trail, Rosemount MN. Harmonica and instruction. Mike Fugazzi, instructor. Open to the public. Ages 8-16, limit 20. Registration required. Call 651-480-1200 to register. Saturday, March 1, 2014, 11 am - noon @ Dakota County Inver Glen Library, 8098 Blaine Ave., Inver Grove Heights , MN. Harmonica and instruction. Nigel Egg, instructor. Open to the public. Ages 8 -16, limit 20. Registration required. Call 651-554-6840 to register. Saturday, May 31, 2014, free Blues for Kids (by Minnesota Blues Society) Harmonica Classes at 1:30pm and 2:30pm in Park Square taught by Harmonica Master and virtuoso Mike Fugazzi. Pre-registration required. Ages 8 to 18. Class sizes are limited to 20, first registered, first served; so sign up today at "Smokin' In Steele" BBQ Blues For Kids. Friday, June 6, 2014, 7 pm at RiverLoop Amphitheatre, 225 Commercial St, Waterloo, IA. Free Blues for Kids Harmonica class by Everett Smithson. Kids! Sign up at event. Saturday, June 7, 2014, 2 pm at Venture Arts, Events and Business Center, 100 North Nelson, Cyrus, MN. Free Blues for Kids Harmonica class by Everett Smithson. Kids! Sign up at event. Wednesday, June 11, 2014, 7 pm at Eagan Festival Grounds Band Shell at Central Park, 1501 Central Parkway. Kids can sign up at the Eagan Market Fest front gate for the free lesson and harmonica during the Everett Smithson Band's intermission. Limited to the first 20 to sign up. Monday, June 23, 2014, 1:00 to 2:00 pm at South St. Paul Library, 106 Third Ave. N., South St.Paul. Harmonica and instruction. Rob Hilstrom, instructor. Open to the public. Ages 8-18, limit 20. Registration required. Call 651-554-3240 to register. Tuesday June 24, 2014, 7pm at Mille Lacs County Historical Society - Princeton, MN. Free Blues for Kids Harmonica class by Everett Smithson. Kids! Sign up at event. Friday, June 27, 2014, 10:00-11:00 am Blues for Kids at Golden's Deli (Workshop Space), 275 East 4th Street, St. Paul, MN 55101. Free Harmonica from Minnesota Blues Society and instruction by Mike Fugazzi. Open to the public. Ages 8-18, limit 20. Register by email: info@midwestharmonica.net or phone/text Sean Wailin O'Phelan at 808-854-3443. Saturday, June 28, 2014, 10:30 to 11:30 am at Heritage Library, 20085 Heritage Drive, Lakeville, MN. Harmonica and instruction. Rhona Brack, instructor. Open to the public. Ages 8-15, limit 20. Registration required. Call 952-891-0360 to register. Monday, June 30, 2014, 2:00 to 3:00 pm at Wentworth Library, 199 East Wentworth Ave., West St Paul, MN. Harmonica and instruction. Rob Hilstrom, instructor. Open to the public. Ages 8-14, limit 20. Registration required. Call 651-554-6800 to register. Saturday, July 3, 2014, at Market Fest, White Bear Lake, MN. Free Blues for Kids Harmonica class by Everett Smithson. Kids! Sign up at event. Saturday, July 12, 2014, 1:30 to 2:30 pm at Hambone Music Festival, History Center of Olmstead County, 1195 Circle Dr SW, Rochester, MN. Harmonica and instruction. Mike Fugazzi, instructor. Open to the public. Ages 8-18, limit 20. Registration encouraged. Email: askme@hambonemusicfestival.com. Friday, August 1, 2014, at Washington County Fair, Lake Elmo, MN. 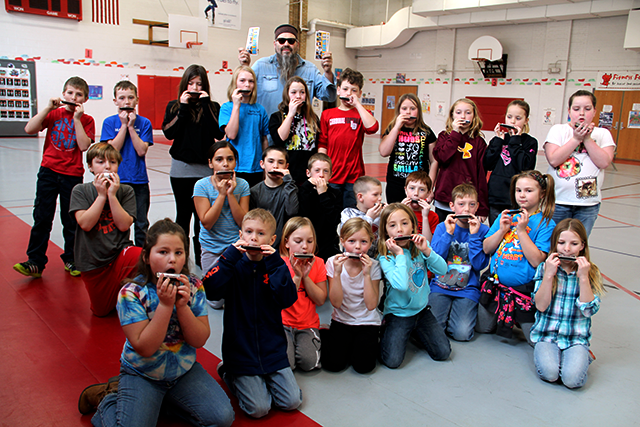 Free Blues for Kids Harmonica class by Everett Smithson. Kids! Sign up at event. Saturday, August 2, 2014, at Crow Wing County Fair, Brainerd, MN. Free Blues for Kids Harmonica class by Everett Smithson. Kids! Sign up at event. Monday, August 4, 2014, 2:00 to 3:00 pm at Pleasant Hill Library, 1490 South Frontage Road, Hastings, MN. Harmonica and instruction. Paul Mejia, instructor. Open to the public. Ages 8-18, limit 20. Registration required. Call 651-438-0200 to register. Thursday, August 21, 2014, Parks Music, Big Lake, MN. Free Blues for Kids Harmonica class by Everett Smithson. Kids! Sign up at event. Saturday, September 20, 2014, 10 am at Chilifest - Mille Lacs County Fairgrounds, Princeton, MN. Free Blues for Kids Harmonica class by Everett Smithson. Kids! Sign up at event. Saturday, September 20, 2014, 5 pm at Takin' Time Music Fall Celebration - Clearwater, MN. Free Blues for Kids Harmonica class by Everett Smithson. Kids! Sign up at event. Sunday, September 21, 2014, 1 pm at Deer Lake Orchard - Buffalo, MN. Free Blues for Kids Harmonica class by Everett Smithson. Kids! Sign up at event. Wednesday, November 5, 2014, Public Library, St Michael, MN. Free Blues for Kids Harmonica class by Everett Smithson. Kids! Sign up at event. June 15, 2 pm @ Dry Bones Blues Festival, Dayton Avenue Presbyterian Church, 217 Mackubin st., St. Paul, Mn. Harmonica and instruction. Rhona Brack,instructor. Open to the public. Ages 8 - 18 Limit 20 Registration required. Call 651-491-6286 or register at festival A second workshop may be available. June 29, 2 pm @ Bulid the Barn Bash - Steele Co Fairgrounds, Owatonna, MN. Harmonica and instruction. Everett Smithson, instructor. Open to the public. Limit 10-15. Show up ready to learn. July 20, 4 pm @ Cajun Fest - Sturges Park, Buffalo, MN. Harmonica and instruction. Everett Smithson, instructor. Open to the public. Limit 10-15. Show up ready to learn. August 24, 2:30 pm @ Mount Olivet Lutheran Church of Plymouth, 12235 Old Rockford Road, Plymouth MN. Harmonica and instruction. Nigel Egg, instructor. Open to the public. Ages 8-18. Limit 20 kids. Registration required. Call 763-232-3455 to register. September 15, 1 pm @ Deer Lake Orchard - Buffalo, MN. Harmonica and lesson. Everett Smithson instructor. Open to the public. Limit 10 - 15 Show up ready to learn. October 5, 4 pm @ Sumner Library, 611 Van White Memorial Blvd., Mpls. Harmonica and instruction. Rhona Brack instructor. Open to the public. Ages 8 - 18. Limit 20. Registration required. Call 612-543-6875 or register online. Thursday, November 7, 4:30 pm @ Oakdale Library, 1010 Heron Ave. N., Oakdale, MN. Harmonica and instruction. Nigel Egg, instructor. Open to the public. Ages 8 - 12. Limit 20. Registration required. Call 651-730-0504 or Register Online. Saturday, November 9, 2013, 10:30 am @ Valley Branch Library, 380 St. Croix Trail S., Lakeland, MN. Free Harmonica and instruction. Nigel Egg, instructor. Open to the public. Ages 8 - 12 Limit 20 kids. Registration required. Call 651-436-5882 or Register Online. Saturday, November 9, 1 pm @ Hardwood Creek Library, 19955 Forest Rd., Forest Lake, MN. Harmonica and instruction. Nigel Egg, instructor. Open to the public. Ages 8 - 12. Limit 20. Registration required. Call 651-275-7300 or Register Online. Saturday, November 16, 1 pm @ Park Grove Library, 7900 Hemingway Ave. S., Cottage Grove, MN. Harmonica and instruction. Mike Fugazzi, instructor. Open to the public. Ages 8 - 12. Limit 20. Registration required. Call 651-459-2040 or Register Online. Tuesday, November 19, 4 pm @ Webber Park Library, (Community Center) 4400 Dupont ave. N., Mpls. Harmonica and instruction. Nigel Egg, instructor. Open to the public. Ages 8 - 18. Limit 20. Registration required. Call 612-543-6750 or Register Online. Saturday, November 23, 2013, 11:00 am @ Wildwood Library, 763 Stillwater Rd., Mahtomedi, MN. Free Harmonica and instruction. Rhona Brack instructor. Open to the public. Ages 8 - 12. Limit 20 kids. Registration required. Call 651-426-2042 or Register Online. Saturday, November 23, 2013 , 2:00 pm @ RH Stafford Library, 8595 Central Park Place , Woodbury, MN. Free Harmonica and instruction. Rhona Brack instructor. Open to the public. Ages 8 - 12. Limit 20 kids. Registration required. Call 651-731-1320 or Register Online. February 3, 5 pm. @ West 7th Community Center, 265 Oneida St, St Paul, MN. Celebrate Black History Month as KFAI's LadyJ Griot (Jacquie Maddix) uses storytelling and live music to show the roots blues have in the music brought with the slaves from their homeland. Hear the spiritual side of this tribal music and how it relates to the 12 bar blues. Open to the public. Ages: 10 and older. February 11, 11 am. @ Dakota County Galaxy Library, 14955 Galaxie Avenue, Apple Valley, MN. Celebrate Black History Month as KFAI's LadyJ Griot (Jacquie Maddix) uses storytelling and live music to show the roots blues have in the music brought with the slaves from their homeland. Hear the spiritual side of this tribal music and how it relates to the 12 bar blues. A Minnesota Legacy program. Ages: 10 and older. April 12, 6 pm @ Great River Regional Library, 13020 Orono Parkway, Elk River, MN. Harmonica and instruction. Everett Smithson, instructor. Open to the public. Ages 8-16, limit 10. Registration required. Call 763-441-1641 tp register. May 5, 11:30 am @ Stillwater Public Library, 224 Third Street North, Stillwater, MN. Harmonica and instruction. Rhona Brack, instructor. Open to the public. Ages 8-16, limit 20. Registration required. Call 651-275-4338 to register. May 26, 2 pm & 3 pm @ Awake the Lakes Rib Fest, Big Ole Park, Alexandria, MN. Harmonica and instruction. Everett Smithson, instructor. Open to the public. Ages 8-16, limit 15 per workshop (2 workshops). Register at the event. June 6, 8 pm @ Way Park, 720 1st St W, Northfield, MN (near St Olaf). Harmonica and instruction. Everett Smithson, instructor. Open to the public. Ages 8-16, limit 10 kids. Register at the event. June 9, 11:15 am @ Music & Book Festival, Burnsville Perfroming Arts Center, 12600 Nicollet Avenue, Burnsville, MN. Harmonica and instruction. Nigel Egg, instructor. Open to the public. Ages 8-18, limit 25. Registration required. Call 952-895-4685 to register, or register at the festival. June 15, 2 pm @ Wescott Library, 1340 Westcott Road, Eagan, MN. Harmonica and instruction. "Boom Boom" Steve Vonderharr, instructor. Open to the public. Ages 8-18, limit 20. Registration required. Call 651-450-2900 to register. June 16, 2:30 pm @ Hambone Music Festival, History Center of Olmstead County, 1195 West Circle Drive, Rochester, MN. Harmonica and instruction. Everett Smithson, instructor. Open to the public. Ages 8-16, limit 10 kids. Register at the event. June 30, 1 pm @ Chautauqua Music Fest, Maplewood Park, 36047 Clear Lake Drive, Waseca, MN. Harmonica and instruction. Everett Smithson, instructor. Open to the public. Ages 8-16, limit 10 kids. Register at the event. July 14, 10:30 am @ Heritage Library, 20085 Heritage Drive, Lakeville, MN. Harmonica and instruction. "Boom Boom" Steve Vonderharr, instructor. Open to the public. Ages 8-18, limit 20. Registration required. Call 952-891-0360 to register. July 21, 4:30 pm @ Cajunfest, Sturges Park, Hwy. 25 & 2nd Ave S, Buffalo, MN. Harmonica and instruction. Everett Smithson, instructor. Open to the public. Ages 8-16, limit 10 kids. Register at the event. July 21, 2:30 pm @ Robert Trail Library, 14395 S Robert Trail, Rosemount MN. Harmonica and instruction. Mike Fugazzi, instructor. Open to the public. Ages 8-18, limit 20. Registration required. Call 651-480-1200 to register. August 25, 3:00 pm @ Mount Olivet Lutheran Church of Plymouth, 12235 Old Rockford Road, Plymouth MN. Harmonica and instruction. Rhona Brack, instructor. Open to the public. Ages 8-18. Limit 20 kids. Registration required. Call 763-559-2775 to register. September 22, 12:30 pm @ Deer Lake Orchard, 1903 10th St SW, Buffalo, MN. Harmonica and instruction. Everett Smithson, instructor. Open to the public. Ages 8-16, limit 10 kids. Register at the event. February 12, 10:30 am. @ Inver Glen Library, 8098 Blaine Ave., Inver Grove Heights , MN. Harmonica and instruction. Nigel Egg, instructor. Open to the public. Ages 8 -18. registration required. Call 651-554-6840 to register. March 15, 5:30 pm. @ Our Lady Of Peace, 5426 12th Ave. S, Minneapolis , MN. Harmonica and instruction. Nigel Egg, instructor. June 4 @ Smokin' in Steele BBQ & Blues Fest, Owatonna. Harmonica and instruction. Mike Fugazzi, instructor. September 3, @ 3 pm. Riverblast 2011 Festival @ the History & Information Center, New Ulm, MN. Harmonica and instruction. Everett Smithson, instructor. Open to the public. Ages 8-18. Limit 20 kids. September 10, 10:30 am. @ Farmington Library, 508 Third St, Farmington, MN. Harmonica and instruction. Rhona Brack, instructor. Open to the public. Ages 8-18. Limit 20 kids. Registration required. Call 651-438-0250 to register. September 24, 10:30 am. @ Wentworth Library, 199 East Wentworth Ave., West St Paul, MN. Harmonica and instruction. Rhona Brack, instructor. Open to the public. Ages 8-18. Limit 20 kids. Registration required. Call 651-554-6800 to register. October 4, 7 pm. @ Westcott Library, 1340 Wescott Road, Eagan, MN. Harmonica and instruction. "Boom Boom" Steve Vonderharr, instructor. Open to the public. Ages 8-12. Limit 20 kids. Registration required. Call 651-450-2900 to register. Nov. 11th, 5 p.m. @ West 7th Community Center, 265 Oneida st. St. Paul, Mn. Harmonica and instruction. Nigel Egg instructor. Nov. 12th 11 a.m. @ Park Grove Library , 7900 Hemingway Ave. s. , Cottage Grove , Mn. Harmonica and instruction. "Boom Boom" Steve Vonderharr instructor. Open to the public. Ages 8 - 12 Limit 20 kids. Registration required. Call 651-459-2040 to register. Nov. 12th , 1 p.m. @ Oakdale Library, 1010 Heron Ave. N. , Oakdale, Mn. Harmonica and instruction. "Boom Boom" Steve Vonderharr instructor. Open to the public. Ages 8 - 12 Limit 20 kids. Registration required. Call 651-730-0504 to register. Nov. 5th 1 p.m. @ Hardwood Creek Library, 19955 Forest Rd., Forest Lake, Mn. Harmonica and instruction. Mike Fugazzi instructor. Open to the public. Ages 8 - 12 Limit 20 kids. Registration required. Call 651-275-7300 to register. Nov. 19th , 1 p.m. @ R.H. Stafford Library , 8595 Central Park Place , Woodbury, Mn. Harmonica and instruction. Nigel Egg instructor. Open to the public. Ages 8 - 12 Limit 20 kids. Registration required. Call 651-731-1320 to register. November 19, 11:00 am. @ Inver Glen Library, 8098 Blaine Ave., Inver Grove Heights, MN. Harmonica and instruction. Rhona Brack, instructor. Open to the public. Ages 8-18. Limit 20 kids. Registration required. Call 651-554-6840 to register. Dec. 3rd, 1 p.m. @ Wildwood Library, 763 Stillwater Rd. , Mahtomedi, Mn. Harmonica and instruction. Mike Fugazzi instructor. Open to the public. Ages 8 - 12 Limit 20 kids. Registration required. Call 651-426-2042 to register. December 10, 10:30 am. @ Robert Trail Library, 14395 S. Robert Trail, Rosemount, MN. Harmonica and instruction. Nigel Egg, instructor. Open to the public. Ages 8-18. Limit 20 kids. Registration required. Call 651-480-1200 to register. March 24, 6:00 pm. @ Hamline-Midway Library, 1558 W. Minnehaha Ave., St Paul, MN. Harmonica and instruction. Nigel Egg, instructor. Open to the public, ages 8-18. Registration required, call 651-643-0293 to register. May 1, 10:30 am. @ Dakota County Galaxy Library, 14955 Galaxie Avenue, Apple Valley, MN. Harmonica and instruction. Nigel Egg, instructor. Open to the public, ages 8-18. Registration required, call 952-891-7045 to register. May 11, 10:20 am. @ Edison High School, 700 - 22nd Avenue NE, Minneapolis, MN. Harmonica and instruction. Nigel Egg, instructor. As part of curriculum for Music Exploration Class. Not open to public. May 18, 10:20 am. @ Edison High School, 700 - 22nd Avenue NE, Minneapolis, MN. Harmonica and instruction. Nigel Egg, instructor. As part of curriculum for Music Exploration Class. Not open to public. June 5 @ Smokin' in Steele BBQ & Blues Fest, Owatonna. Harmonica and instruction. Mike Fugazzi, instructor. April 20, 4:30 pm. @ North End Elementary, St. Paul. Harmonica and instruction. Nigel Egg, instructor. May 19, 5:00 pm. @ Rice Street Library, 1011 Rice St, St Paul, MN. Harmonica and instruction. Nigel Egg, instructor. Open to the public, ages 8-18. Registration required, call 651-558-2223 to register. May 30 @ Smokin' in Steele BBQ & Blues Fest, Owattona. Harmonica and instruction. Mike Fugazzi, instructor. July 18, 3:00pm @ Deep Blues Festival. Free to the public. Harmonica and instruction. Everett Smithson, instructor. Limited to first 25 kids. July 19, 3:00pm @ Deep Blues Festival. Free to the public. Harmonica and instruction. Everett Smithson, instructor. Limited to first 25 kids. July 20, 3:00pm @ Deep Blues Festival. Free to the public. Harmonica and instruction. Nigel Egg, instructor. Limited to first 25 kids. July 26, 2:00pm @ The Coffee Grounds Music Festival. Free to the public. Harmonica and instruction. Nigel Egg, instructor. Limited to first 25 kids. Twenty-one Girl Scouts and their leaders participated in a Blues For Kids workshop held on July 20 in collaboration with the Minnesota Dreams Girl Scout Jamboree. for the pure single note. The Twin Cities metro area has 8 new harmonica players thanks to a successful Blues For Kids workshop held July 14. The attendees received free harmonicas and a professional lesson. Instruction covered practice techniques, ways to play harmonica notes, chords and scales. The group learned a common blues riff and two songs. Recommended artists for learning by listening as well as on line resources were shared. Most of all, the kids learned to have FUN with music. Blues For Kids has been initiated to fulfill one of the stated missions of the Greater Twin Cities Blues Music Society: "to provide learning opportunities related to this American-roots music genre." 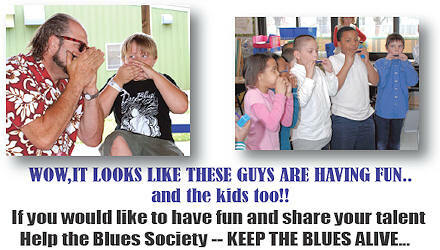 Blues For Kids introduces children to the blues by providing a free professional harmonica lesson and harmonica. Scheduled through community organizations and events, our first programs were held in July 2007 at the Coffee Grounds in St. Paul and in collaboration with the local Girl Scout Council. Additional event opportunities are being sought. Volunteers are needed in many aspects of the Blues For Kids program, from assisting with events to fundraising. Email us at info@gtcbms.org for more information. Pete Berglund was passionate in music and was a member of local blues band Armadillo Jump. As "Uncle Puffy" he enthusiastically excelled at harmonica and guitar. Pete passed away unexpectedly in May 2006 and was loved by his friends, respected by his peers and is sorely missed by all who knew him.